Five days after being crowned Miss Rwanda 2018, The New Times paid a courtesy visit to Lillian Iradukunda, who beat 19 other girls to the crown at the Miss Rwanda 2018 grand finale at the Kigali Convention Centre main auditorium on Saturday February 24. Although she contested from the Western Province (Rubavu District), Iradukunda lives in Kigali with her parents; Paul Ndoli and Chantal Uwimana. The mother is a clothing trader in downtown Kigali, while Ndoli is a businessman who plies his trade between Rwanda and Tanzania. Both were not at home when we visited. How did the parents react to the news of her win? "You did it! You made it! You're Miss Rwanda, we're very proud of you ... we have been praying over it for God to guide you,' Iradukunda explained. "My mum used to pray to God so I can be crowned Miss Rwanda," she said. The family home is a modest and gated residential house located near the popular Cercle Sportif sports complex in Nyarugunga, Kigali. This is where Iradukunda was raised as a child. The first thing we saw once we walked through the gates on late Wednesday afternoon was the beauty queen's winning prize - a brand new black Suzuki Baleno from Rwanda Motors?. 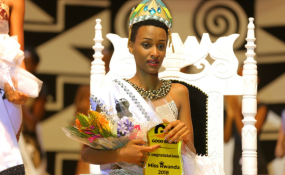 The inscription; "Miss Rwanda 2018, offered by Cogebanque" screamed loudly from the car's windscreen. Parked behind this car was a more modest and older family car. Inside the house, there was a small buzz of activity, with about five people in the living room. These included officials from Rwanda Inspiration Backup, the franchise holder for the Miss Rwanda beauty pageant, led by the CEO, Diudonne Ishimwe, and a few friends of Iradukunda. We settled for soft drinks as we geared for the interview. Iradukunda, we were informed, was in her room getting ready. This was our first introduction to Iradukunda's modest side. One by one, she welcomed each of us with a hug. "Is it okay inside here, or do we sit outside?" she later implored, before we suggested outdoors. Then she carried one of the dining chairs out to the balcony, and another, despite our assurances that we would each carry our seat. Outside the gate, a small crowd of curious onlookers had begun to gather, mostly little children from the neighborhood shouting 'Nyampinga, Nyampinga' as they tried to peep through the gate. We sat next to the Suzuki Baleno, admiring and talking about it. The 18-year-old revealed that the car is worth Rwf18m. Iradukunda is yet to drive the car. She can't drive just yet, but is enrolling at driving school soon. "I want to drive my sisters and my best friends in it. I would like to go with it everywhere," she said while taking out the polythene covers in the car's interior. Iradukunda is currently in her S6 vacation, and apart from her upcoming tight schedule as Miss Rwanda, she is also looking forward to joining university, where she hopes to pursue tourism studies. "My dream is to become a big entrepreneur as a tour operator because I love tourism," she revealed. She is the seventh child in a family of eight siblings, four brothers and three sisters. Incidentally, at the pageant grand finale, she was contestant number 7. "I'm enjoying each and every moment. The people at home see me ordinarily, like how they used to take me before. Everything is normal here." "Not at all. Instead it inspires me and keeps me humble to know that I'm Miss Rwanda; it's something that is more inspiring than scary. There are other responsibilities that I took on automatically once I was crowned Miss Rwanda but I'm pretty sure that it's not too much. I'm going to handle it and do what I planned to do as Miss Rwanda and it's not really impossible. About my friends, of course, I still have them and I'm going to keep them because this has changed nothing." As Miss Rwanda, she plans to develop a viable charitable project around the country's cultural tourism sector. "I plan to organise some festivals where we will be able to showcase our culture, dance, clothes, food and just about everything in our culture. That will attract tourists and other people to our culture. The second thing is to organise cultural trips based on visiting cultural sites where everybody will be able to experience a lot about Rwandan culture," she said. "I was a very shy girl. I was this quiet girl who hardly said anything. I had a dream but I realised it after. I was shy but not anymore." She revealed that the idea to contest in Miss Rwanda first occurred to her while in senior one, at the time Aurore Mutesi was Miss Rwanda. That was in 2012. Mutesi is actually one of the people that inspired her, besides other previous beauty queens. "I intend to do something different from the previous beauty queens. I will work hard and we will see the results. I think the previous Miss Rwanda winners worked so hard and so good," said the beauty queen who almost didn't make it to boot camp. She passed the provincial selections on probation. Currently she has no boyfriend and asked why, she replied, "I don't know why." As a Christian she attends Zion Temple Church in Kicukiro. "One place I really love in Rwanda is Nyungwe Forest National Park. My role model in this country is the First Lady Jeannette Kagame because she supports girls. I'm humble, active and a little bit shy. I can be a little crazy, but not mentally. I like to disturb people a lot," she joked. Iradukunda hopes to walk in the steps of her previous two predecessors - Elsa Iradukunda (Miss Rwanda 2017), and Jolly Mutesi (2016), who are the only Miss Rwanda winners to have represented the country at Miss World so far. "I'm ready and I think I can do it. I can be Miss World, just like I never knew that one day I would be Miss Rwanda. "I think its confidence. They taught us to be confident in boot camp. You have to project confidence even when you are nervous," she said.